Marc shares some of the events that happened on this day in history, including the birthday of activist Clara Fraser, the day artist Romare Bearden passed away, and the day Charles “Bird” Parker, Jr., hall of fame jazz saxophonist and composer, died. This is Marc Steiner, and today is March the 12th. We lost Edward P. McCabe today in 1920, attorney and one of the first African Americans to hold a major political office in the old west. McCabe was born October 10, 1850 in Troy, New York. He worked on Wall Street as a young man but moved to Chicago, Illinois in 1872 where he was appointed clerk in the Cook County office of the United States Treasury Department. He moved to Nicodemus, Kansas in 1878 and in 1882 was elected Kansas State Auditor, becoming the highest ranking African American officeholder outside of the Reconstruction South. McCabe served two terms as state auditor. In 1890, he moved to the Oklahoma Territory and acquired a 320 acre tract of land which in 1892 became the town of Langston. McCabe was an advocate of Black people moving to Oklahoma and supported the idea of making Oklahoma an all-Black state. Between 1900 and 1906 the Black population of Oklahoma more than doubled. On March 12, 1897, McCabe helped found the Colored Agricultural and Normal School which later became Langston University. And the Girl Guides were founded today by Juliet Gordon Lowe. That organization later became The Girl Scouts of the USA. The World War II alliance that defeated the Nazis and the Japanese officially unraveled today when President Harry Truman unveiled The Truman Doctrine today in 1947. This proclaimed to help stop the spread of Communism across the world. The Black, Coloured and Indian churches in South Africa issued a statement today in 1980 on the controversial Immorality Act and the Mixed Marriages Act. These acts criminalized the “intermixing of couples of different races,” not just in marriage but also in all sexual relations between blacks and whites. These laws were at the foundation of the South African apartheid government. Those found guilty of disobeying this law were subject to 7 years in prison and lashings. 1952 – The parents of Cornelius H. Charlton were presented the Congressional Medal of Honor, America’s highest military decoration, for Charlton’s actions during the Korean War. Charlton was born July 24, 1929 in East Gulf, West Virginia but raised in The Bronx, New York. A career soldier, Charlton was sent to Korea he requested combat duty and was assigned to Company C of the 24th Infantry Regiment, 25th Infantry Division, the last all-Black regiment. On June 2, 1951, near the village of Chipo-ri, Korea, his platoon came under heavy fire and his platoon leader was wounded. Sergeant Charlton took command, regrouped his men, and led an assault. Wounded by a grenade, he refused medical attention… continued to lead the charge…. single-handedly he attacked and disabled the last remaining enemy gun emplacement. While doing this, he suffered another grenade wound and died on the battlefield giving his life to save his entire company..
We also lost the great Romare Bearden, artist and author, died today in 1988. 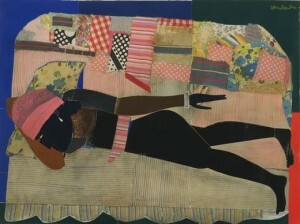 His colorful montages depicting African-American life are iconic. And it’s the birthday of activist Clara Fraser, who co-founded the Freedom Socialist Party and Radical Women.